Game Preview: Checkers at Bears, 7 p.m.
02/09/2019 - The Hershey Bears look to extend their current point streak to 11 games, and match a season-best five-game winning streak tonight against the top team in the AHL, the Charlotte Checkers. The Hershey Bears extended the club's point streak to 10, and winning streak to four games on Wednesday night with a 4-2 win over the Springfield Thunderbirds. Hershey scored four straight goals to take a commanding 4-0 lead, and tallied twice in each of the first two periods. Riley Barber scored his 19th goal of the season at 7:15 after finishing a loose puck battle in the blue paint. At 9:40, Liam O'Brien doubled his team's lead after burying his own rebound on a breakaway chance. Steve Whitney earned the eventual game-winner at 12:16 of the second period after blasting home a one-time feed from Beck Malenstyn behind the net. Garrett Pilon rounded out Hershey's offense with the Bears seventh unassisted goal of the season after a turnover in front of the T-Birds net. Charlotte was last in action on Wednesday, dropping a 5-1 decision to the Cleveland Monsters. Nick Schilkey scored the only marker for the Checkers at 9:04 of the first period. 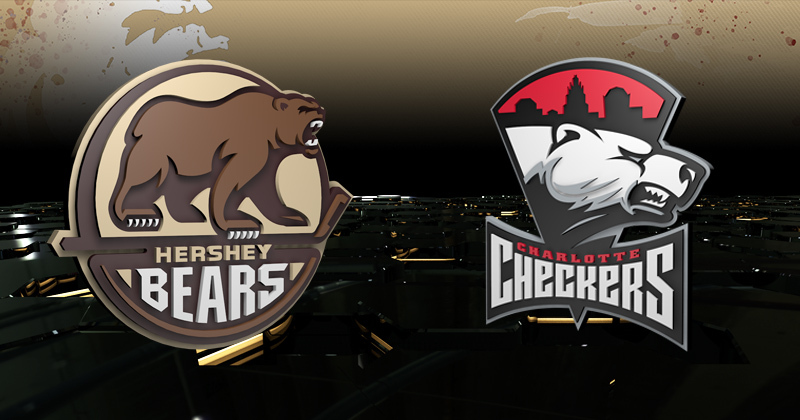 Nearly four months separate the last time Hershey and Charlotte battled in the season series. Both teams met for a back-to-back stretch on Oct. 19 and 20 at Bojangles' Coliseum. The Chocolate and White claimed three out of four possible points by dropping a 4-3 shootout decision on Oct. 19, followed by a 2-0 shutout win the next night. Shane Gersich (one goal, one assist), Lucas Johansen (one goal, one assist), and Connor Hobbs (two assists) all lead Hershey in scoring in the season series. Janne Kuokkanen (one goal, one assist) and Andrew Poturalski (two assists) both lead Charlotte in scoring against the Bears. Hershey goaltender Vitek Vanecek's only shutout this season came on Oct. 20 at Charlotte as he turned aside 25 shots. Since the calendar has turned to February, the Charlotte Checkers enter tonight's game with just five goals in their last four games. The Checkers were shutout on Feb. 2 in a 1-0 overtime loss to Providence, and scored only one goal on Feb. 1 and Feb. 6. One of Charlotte's five goals this month have been on the power play, and they have totaled just 1-for-12 on the man-advantage in that span. On the opposite end, the Chocolate and White have also seen recent struggles on the power play. During their current four-game winning streak, the Bears are a combined 2-for-21, and 0-for-16 in their last three. The last meeting on Oct. 20 between the Bears and Checkers marked a season-high 42 penalty minutes for the Chocolate and White, and 74 combined between the two clubs. Charlotte's roster features AHL heavyweight and veteran enforcer Zack Stortini. Dating back to the 2006-07 season, Stortini has 124 penalty minutes in 36 games against the Bears, averaging 3.4 penalty minutes per game. On Mar. 8, 2014, Stortini engaged in a fight with current Bears assistant coach Patrick Wellar in Norfolk. Tonight's game features a reunion between Hershey head coach Spencer Carbery and Charlotte assistant Ryan Warsofsky. From 2014-16, Warsofsky was an assistant under Carbery with the ECHL's South Carolina Stingrays. In 2016, Carbery departed for a head coaching position in the OHL with the Saginaw Spirit, before receiving a position with the Providence Bruins next season as an assistant coach. While in Saginaw, Warsofsky replaced Carbery as the head coach for the Stingrays before joining the Charlotte Checkers staff this season. Hershey's Kris Bindulis, Hampus Gustafsson, Joey Leach, Tyler Lewington, Mason Mitchell, Vitek Vanecek, Nathan Walker, and Steve Whitney all played under Warsofsky's guidance in South Carolina.